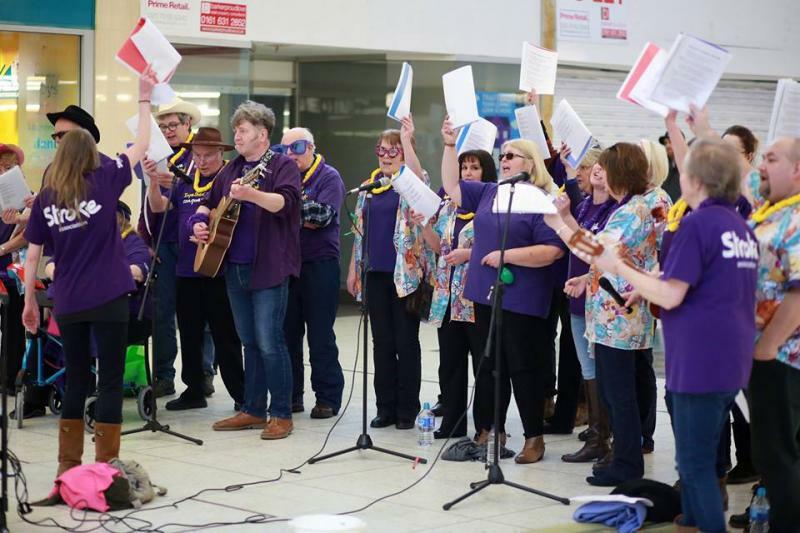 The North West Community Stroke Choir is a Stroke Association Voluntary Group for people affected by stroke in NW region. We meet every Monday, and alternate between locations in Stockport and Manchester. The choir is made up of stroke survivors, families, volunteers and people who work with, or who have been affected by, stroke. The only requirement to join is a connection to stroke and a desire to sing - there are no auditions. Because it sets us free from aphasia. It’s so frustrating to get stuck with words, but with singing it’s different. It’s good for the facial muscles - my mouth stopped drooping after 2 or 3 weeks, and things like do-bi-do-bi-do are very good. I like to learn new things, it exercises the brain. It helps me switch off from stresses and is very enjoyable. It is something to look forward to. It's healing, fun, energising, spiritual. It lifts my spirits and my mood. There is a feeling of togetherness, we all feel better being part of the group. When you get it right there is nothing better, there is a big sense of accomplishment. Reduces social isolation - I don’t get out much other than appointments. It’s the highlight of my week. Has improved my confidence and raised my mood following my second stroke. Love the choices of songs we get to sing- Our choir leader Carol is amazing and very inspiring. We regularly perform as a choir. Both at stroke wards in hospitals around Manchester, and at public events. Choir members say: "It is a fantastic feeling performing the songs we have worked hard to learn and to see peoples’ reactions to our songs. The feedback we receive is brilliant and makes it all worthwhile." But if you don't want to perform, you don't have to! Just coming along to practices for a sing-a-long is absolutely fine too. After opening the national Life After Stroke Awards in London last November, it was wonderful to also be given the opportunity to open our very own regional North West Life After Stroke Awards in AJ Bell Stadium, Salford. The choir became radio stars on December 18, with three songs recorded at Media City, Salford, and featured on BBC Radio 5 Live! The recordings formed part of a feature which included one of our amazing choir members, Ann Williams, sharing her very moving stroke story. The choir had the fabulous opportunity to perform with the Manchester Camerata as part of their Festive Happening at the Albert Hall, on December 9 2018. It was a busy week for the choir, as straight on the heels of picking up the 'Stroke Group Award' at the national Life After Stroke Awards in London, some choir members performed at a Leonard Cohen Appreciation Evening at St James and Emmanuel Parish Hall in Didsbury on Saturday. On November 21, the choir was honoured to not only sing to open the national Life After Stroke Awards in the Landmark Hotel in London, but to also collect the ‘Stroke Group Award’, which was presented by Stephanie Beacham, Mark Goodier and Baroness Benjamin.